I'm Daniela. I'm a web designer enamored with beautiful living and gorgeous interiors. Aesthetic Oiseau merges my interests - the Web and interior design. I live in Alexandria, Virginia with my husband Carter in our first house. We had a vision for this place when we signed on the dotted line and are well on our way to fulfilling it with sweat equity and lots of patience. I'm Latina and I'm Southern. I'm a Wahoo. I love Chinoiserie and stripes. My pearl earrings are my safety blanket. Fabric is my guilty pleasure. My car is red, my living room green. My combination is unique. I hope it's a fresh perspective for the blogosphere, although the themes will be familiar. Aesthetic Oiseau is a mix of various things, all pertaining to interior decoration. DIY how-tos, inspirational spaces, brilliant designers, my own renovation stories, great resources, fab ideas - anything to do with creating a beautiful home and life via design. At least that's what I think it is - we'll see together how AO develops. 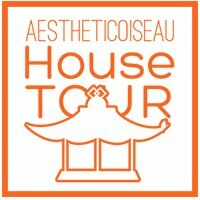 Please join me as Aesthetic Oiseau takes flight...I promise good things. Yes - you are! And I don't even have content up yet :) But thank you so much - your comment has put a big smile on my face. I'll be up and running soon - all sorts of design goodies. Hope you'll check back! Very nice, D :) I look forward to more posts! Daniela! I love this... I have to send you pics of our first house and our designs! I am obsessed with home design. Hi Daniela, I just found your blog through HHFITD and had to comment on your first entry because I'm also a Latina, also live in Northern Virginia, and also a Wahoo! I'll be following your blog for sure. Hi! I just found you through my tumblr account somehow. I'm a Wahoo myself, and I write a design blog for designpublic.com. I'm Becky. Nice to meet you! Hi Daniela would you be able to tell me where I can purchase that beautiful fabric vintage blossom in citrine? Ir even better if I can buy it in draperies. Thank you!